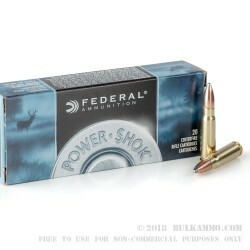 Federal’s 7.62x39 Power Shok ammo has been a favorite of hunters for a long time because of its reliable and consistent performance. 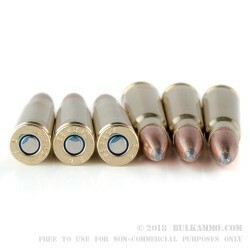 These rounds have a soft pointed projectile that’s designed to expand on impact leaving a large cavity. They are brass cased, therefore non-magnetic and reloadable. A necessity for the avid hunter or simply for target practice. The traditional lead-core hunting bullets in these rifle loads provide accuracy and power at a fair price. 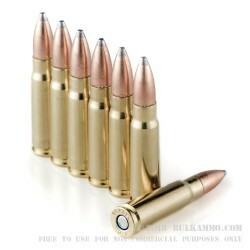 Suited to a wide variety of medium and big game, these rounds fly with a muzzle velocity of 2350 ft/sec! If that’s not impressive enough, the energy of these tiny missiles is 1508 ft/lb. That’s crushing. Definitely designed to make whatever is on the receiving end have a really bad day. 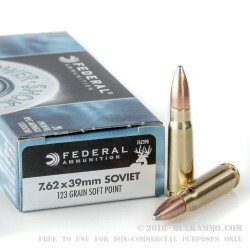 Located on 175 acres in Anoka, Minnesota, Federal Premium Ammunition manufacture a total line of rimfire, centerfire, shot shells and different components. They employ almost 1,400 employees at their Minnesota factory, and they are part of the largest ammo manufacturer, Vista Outdoor. Federal focuses on cutting edge technology and continues to stay in the forefront of ammo purchasers everywhere. Q: Is this non corrosive ammo? A: Hello Jeff, This ammunition is loaded with all non-corrosive components.